Golf Zoo's Blog: Bent Grass is no longer King in my book. My entire golfing career (if you call it that) I have always said how much I love putting on Bent Grass greens and how much I despise Bermuda. The "older" Bermuda greens have always had thicker blades of grass and you could never count on the ball having a true roll. You always stood and watched your ball zig zag towards the hole hoping it zagged at the right time into the bottom of the cup. Here in Myrtle Beach more and more courses are changing over to the new and improved strands such as Mini Verde and Champion Ultra Dwarf and wow are they good! The blades are as thin as Bent giving a great roll but require far less maintenance. This past summer with 90 degree plus temperatures virtually everyday was the tipping point for golf course owners as the Bent could just not survive while the new bermuda greens were thriving. If you would like to see for yourself just how good they are here are a couple of courses in the Myrtle Beach area to try: TPC Myrtle Beach, Arrowhead, Legends- Heathland or Rivers Edge. 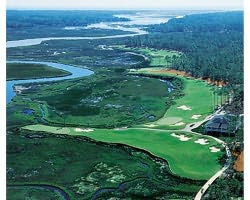 Call myself or one of other Myrtle Beach golf vacation specialists a call at 888.929.7300.